There are many types of skin cancers – each have their own peculiarities and so treatments vary. Three main types of skin cancers however make up over 90% of all skin cancers. Of the 3 main types only melanoma is officially registered on the national cancer data base. With over 2000 new cases of melanoma (plus an additional 2000 cases of melanoma-in-situ) in NZ every year it accounts for over 10% of all newly registered cancers. It is estimated approx 35% of the European population can expect to develop a BCC, about 10% a SCC and about 3% a melanoma over their lifetime. Can be red, pale or pearly coloured and flat, scar like or a lump in form. They rarely, if ever spread to other parts of the body from which they grow and so have an almost 100% cure rate once fully removed. You can of course grow further BCC’s. They can also cause a lot of problem in the area they grow, especially if growing around eyes, behind ears or around the base of the nose. Squamous Cell Carcinomas usually behave like BCC’s when small but can spread to other parts of the bodies if they get big or in their more aggressive forms. 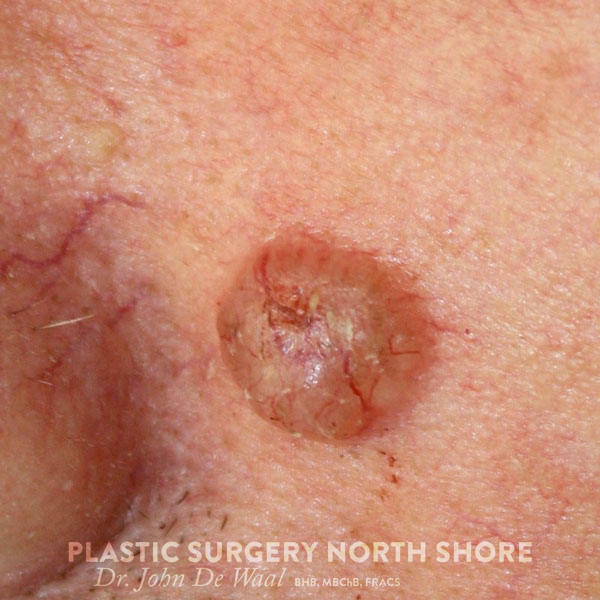 They usually appear as a thickened, crusted area or lump that grows over several weeks to months. SCC’s usually arise in areas of sun damage. 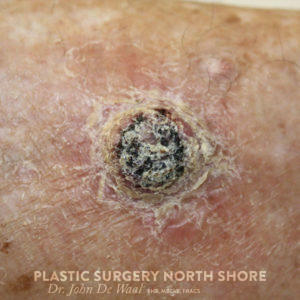 They are often preceded by the appearance of crusted damaged skin (Solar Keratoses). Their appearance is strongly related to accumulated sun damage. For this reason sunscreens and other preventative measures play a very big part in minimising their appearance. Theses arise from the pigment cells in the skin and are the most dangerous type of skin cancer. They usually appear as an irregular freckle or mole that changes in colour, size or shape over a period of months. They are often flat in appearance. If untreated they will spread to other parts of the body. If treated early more than 95% can be cured. TREAMENT OF MELANOMA – Surgery is the mainstay of melanoma treatment. At this time, surgery is the only known curative treatment for melanoma. 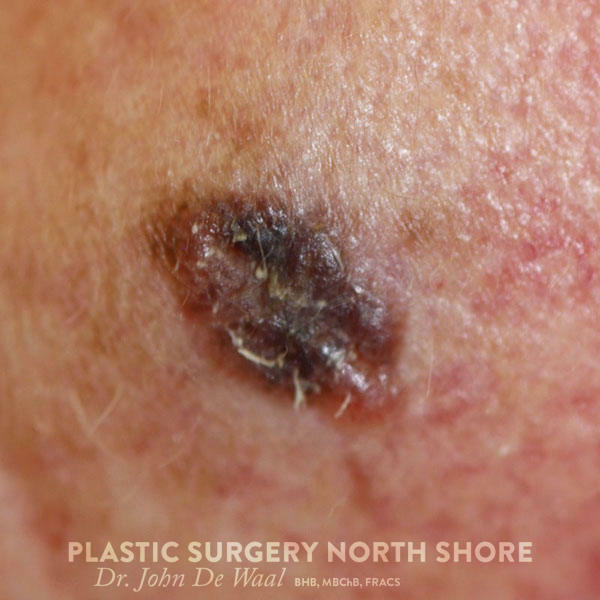 Surgery is usually fairly aggressive and involves wide removal of the melanoma and pre-melanoma changes. There are some exciting new chemotherapy drugs which have been shown to have some effect on melanoma cells, causing some reversal of the cancer process. Only time will tell whether they can be curative in some cases. In NZ, Pharmac has approved funding for two drugs in 2016 – pembrolizumab (Keytruda) and nivolumab (Opdivo) – both ‘immune system stimulants’.